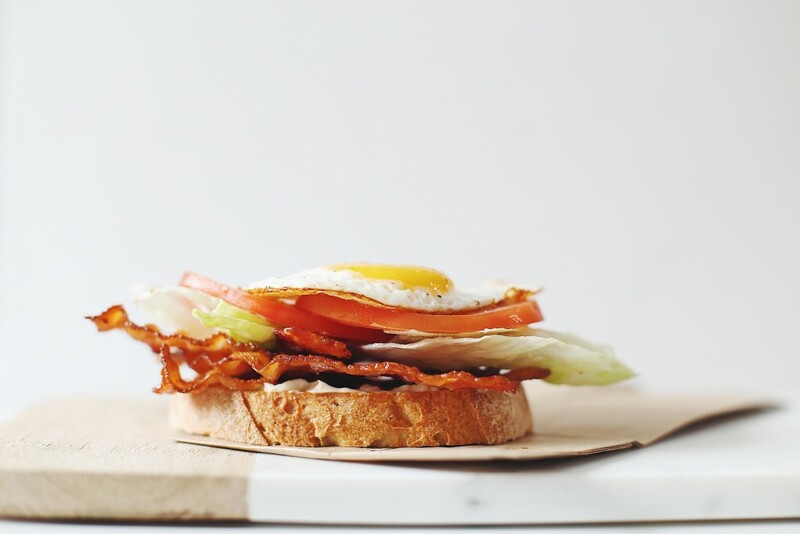 It doesn’t get much simpler than a BLT. It’s one of those things that you don’t want to mess with. Toasted bread, crispy bacon, lettuce, tomato, and lots of mayo. That’s all you need. Oh, and don’t forget to throw on a fried egg. Fried eggs really do make everything better. They also have the magical ability to turn any meal into breakfast. 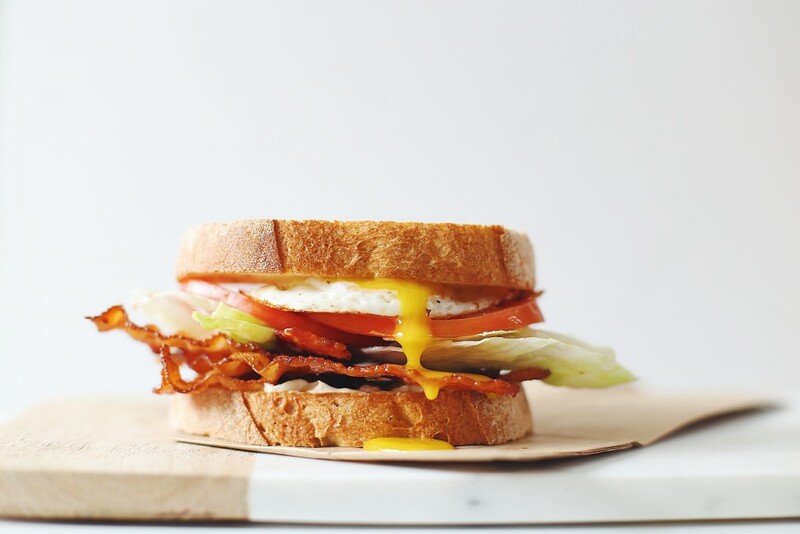 Sure, there is nothing wrong with a plain old BLT with out the egg, but the runny yolk takes it to the next level and after having it once, you won’t want BLTs any other way. There really isn’t much that needs explaining about this recipe. I used a sourdough, but you can use any bread you want. Same goes for the lettuce. I like the crispness of iceberg but any greens will do. You could go for romaine, or change it up and use arugula or even kale. I personally like to stick with mayo on my BLTs, anything else feels a little wrong to me. 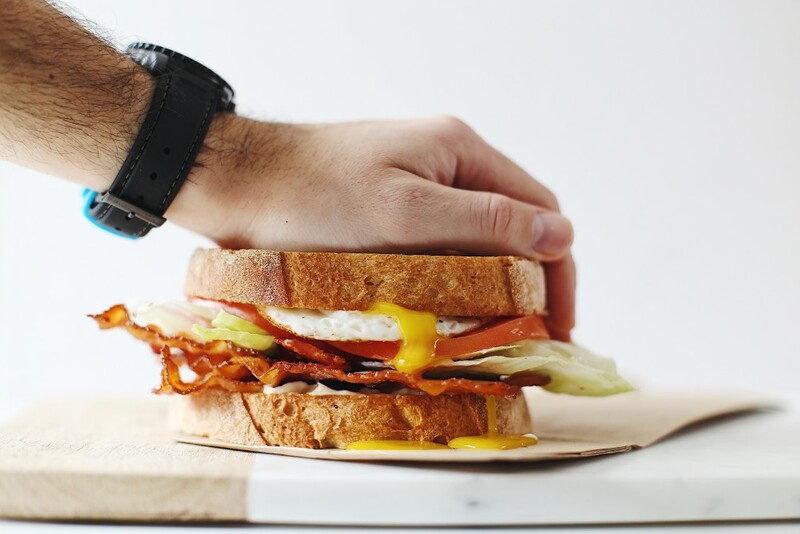 Don’t forget to give the sandwich a good squish to burst the yolk before eating it. You want it to drip all over the bacon. Napkins may be necessary. This recipe is a for one sandwich, so adjust the amounts depending on how many you want to make. Start by preheating the oven to 400°F and lining a baking sheet with foil or parchment paper. Lay bacon flat on sheet and place in preheated over for 15-20 minutes, keeping an eye on it as exact cooking times will vary. As bacon cooks, preheat a non-stick pan over medium low heat and either melt in butter, or drizzle in olive oil. Carefully crack the egg into the pan and allow it to fry until the whites are set leaving the yolk runny, this will take about 3-4 minutes. When ready to build the sandwiches, toast the bread and spread mayo on 1 side of both pieces of bread. Pile on the bacon, lettuce, and tomato and then season to taste with salt and pepper. Carefully place the fried egg on top adding a bit more salt and pepper if desired. Place the top piece of bread on mayo side down and give it a quick squish to burst the yolk. This entry was tagged bacon. Bookmark the permalink.